Winter is well and truly on it's way. The leaves are falling and you can feel the bite of the wind in the air. Your more tender plants will now need some protection from the frost and freezing cold rain. We recommend you move these into your greenhouse or if you don't have one - another sheltered warm place. Worst case scenario you could consider wrapping both plants and pots to stave off Jack Frost's icy assault. Especially a nuisance if you live in a windy area, wind-rock can reek havoc on that beautiful rose bush you've worked so hard to cultivate over the years. Perhaps you planted a rose bush to celebrate an important event or new arrival, don't see that wonderful floral display damaged. 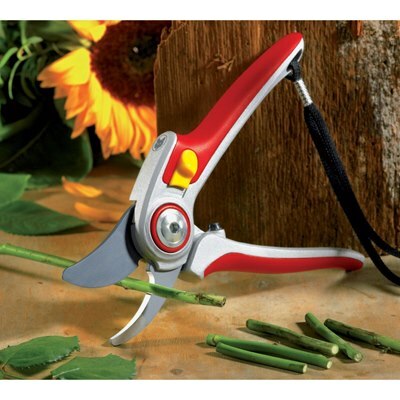 You need a trusty pair of Wolf Garten Secateurs to trim back your roses. The Wolf Garten Professional Bypass Aluminium Secateurs RR5000 really are a cut above the rest. With a bypass cutting action for a clean cut and a ergonomic grip for effort saving transmission of power. They are the obvious choice for this month's prestigious - Tool of the Month. Boasting a generous 25mm cutting diameter, these lovely snips offer you a clean, smooth and importantly; a precise cut. Just what you need for trimming roses.